You can't ask for a more comfortable choice in a thong sandal. The footbed features a deep heel cup for balance and support, built-in arch support, and a toe bar for the natural gripping motion of your toes. 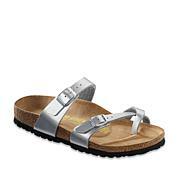 The Gizeh offers the familiar feel of a flip-flop, but with the security and support to keep the foot in a natural, healthy walking position. I fell in love with these sandals last year. I was looking for a pattern, this one is stylish. The shoes are very comfortable. 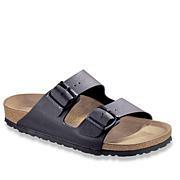 If you've never worn Birkenstocks before, you'll need to adjust to the foot bed. I hope they never stop making this style. My new favorite. Very consistent to the quality I expect from Birkenstock. Im a lifelong fan! Sizing, stylish, quality, and comfortable! Love the support Birkenstocks provide. If the toe post is bothering you, make sure you adjust the strap tight so that your foot doesn't move around in the shoe. 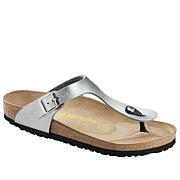 I found that tip on Birkenstock's website and it helped me immensely. The metallic colors are new and on trend. 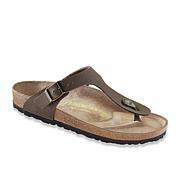 I have loved Birkenstocks since 1988 when my ex husband was stationed in Germany! That was my first pair since then I have had four pair! The sandals are the first ones and I love them! I knew buying them that they would be stiff... but my biggest issue was that they narrowed from front to back. It felt like the inside of my foot was on the edge all the time. I have an average foot but this shoe was too narrow. Loved the style though; unfortunately had to send back. Reel in the hottest spring and summer shoe to hit the runway since the return of the gladiator. This fisherman-style flat brings casual comfort and high-fashion design together for the must-have look of the year.